PayPal is an online payment processor. Once you set up your PayPal account, you can connect it to Doorkeeper to collect prepayments for your event. There are 3 types of PayPal accounts: Personal account, Premier account or Business account. To receive payments, Premier account or Business account is required. After your account is created, please get your PayPal account verified to lift your limits so you can withdraw more money. From the "Payment settings" of your "Community Dashboard" page, click the "Connect PayPal" button. 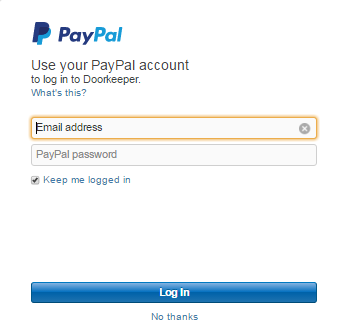 Type your Email address and PayPal password that are used for the PayPal account you want to connect to Doorkeeper. By clicking “Log in” button, you can get ready to start accepting payments with PayPal. You can withdraw money from your PayPal account to your bank account at no cost. After you link both accounts on your PayPal page, click "Withdraw" on the page to transfer money to your bank account.